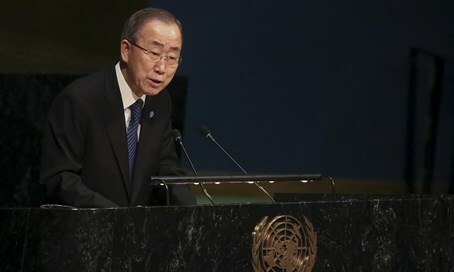 UN Secretary-General Ban Ki-moon blasts Israel one day after sympathizing with terrorists. UN Secretary-General Ban Ki-moon on Wednesday once again criticized what he called Israel's "stifling occupation" of Palestinians, just one day after appearing to express sympathy for Palestinian Arab terrorists. The UN chief made clear that he would not retreat from his remarks directed at Israel a day earlier, AFP reported. UN diplomats said privately that Ban had upped the pressure on Prime MInister Binyamin Netanyahu in a final bid to revive hopes for peace before he steps down as secretary-general at the end of the year. "After nearly 50 years of occupation -- after decades of waiting for the fulfilment of the Oslo promises -- Palestinians are losing hope," Ban told a UN committee on Palestinian rights on Wednesday, according to AFP. "Young people especially are losing hope. They are angered by the stifling policies of the occupation," he blasted. Speaking to the UN committee, Ban reiterated that "nothing excuses terror" but added that a security clampdown will not succeed in settling the Israeli-Palestinian conflict. The UN chief called for a return to negotiations, saying it was the "one and only path to a just and lasting solution -- an end to the occupation that began in 1967" and a Palestinian state. "You can count on me to continue to speak up and speak out -- to push and to prod -- to do all in my power to achieve long-overdue Israeli-Palestinian peace," he added. Ban said Palestinians had heard "half a century of statements" condemning Israel's "occupation", but that their lives had not improved. "We issue statements. We express concern. We voice solidarity. But life hasn't changed. And some Palestinians wonder: Is this all meant to simply run out the clock?” he said, according to AFP. "They ask: Are we meant to watch as the world endlessly debates how to divide land while it disappears before our very eyes?" added Ban. The UN chief’s remarks come just one day after he appeared to justify Palestinian terrorism against Israelis, saying the attacks were a result of "Palestinian frustration". "There is no justification for terror. The Palestinian murderers don't want to build a state - they want to destroy a state (Israel), and they say it out loud. They want to murder Jews wherever they are, and they say it out loud. They don't murder for the sake of peace and they don't murder for the sake of human rights,” he added. "The UN long ago lost its neutrality and its moral authority, and these words of the Secretary-General don't make the situation any better." A host of Israeli politicians blasted Ban’s remarks as well, including Deputy Foreign Minister Tzipi Hotovely, Yesh Atid chairman Yair Lapid and Housing Minister Yoav Galant. Ban's speech on Tuesday came shortly after Israel's UN Ambassador rebuked the Security Council for failing to condemn a single Palestinian terror attack against Israelis since the ongoing wave of terrorism began several months ago.